The Wrap Deluxe Portable Vehicle Security System The Wrap Deluxe Portable Vehicle Security System, Steering Wheel Lock, Steering Wheel Security System, Portable Steering Wheel Lock, Portable Steering Wheel Security System, Vehicle Security System, Portable Vehicle Security System, Vehicle Security Lock, [The Wrap BLS045 Security System] - $99.95 : 3rd Strike Performance, Your Source for Late Model MOPAR Performance Parts and Accessories! It's no secret that auto theft, airbag theft, and joy riding are on the rise. The National Insurance Crime bureau estimates that $7 billion in vehicles are stolen each year. Thieves typically look for easy targets—vehicles that can be stolen in two minutes or less. If theft will take longer, the thief will usually move on to an easier target. 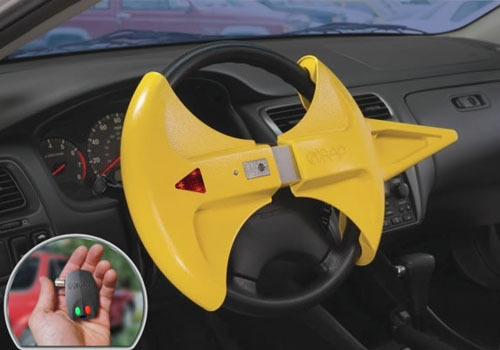 Make a crook think twice with The Wrap Deluxe Portable Vehicle Security Device, a highly effective theft deterrent device that renders the steering wheel unusable. The Wrap Portable Vehicle Security System provides multilayered protection against threats to your vehicle while providing you, the owner, with the convenience of portability. Ensure that your vehicle is safe with proven protection. The Wrap is easy and convenient to use while safeguarding against theft and giving you peace of mind. Note: Please measure steering wheel prior to ordering to ensure proper fit.